An iguana is an iguana is an iguana! Some say but that is not the case! Although the invasive iguana located in the Soufriere area has similarities with our unique St. Lucia iguana found at the North East coast; there are marked differences. v Both iguanas are known scientifically as Iguana iguana having the same local name The Green Iguana. v Their offspring are bright green. v They feed on the same umbrella vine known as lyenn dous. v Their defense mechanism is lashing their opponents with their long hard tail. v They both are tree lovers and are able to conceal themselves in the tress. v The nesting period is from February to May. v Found along the North East Coast of the island; Louvette and Grand Anse. v Adults are light green with predominant black stripes. v Adult males have a piece of black skin hanging from their neck which is called a dewlap that could be inflated to attract females during courtship. v Scales to the back of their head near the jawbone is smaller. v Occupies the west coast (Soufriere) of the island and was brought to the island by individuals as pets from Canada. v Adults color remains the same bright green as the young ones. v Adult males have a bright orange dewlap. v Females lay more than 50 eggs in one clutch. Larger scales to the back of the jawbone. 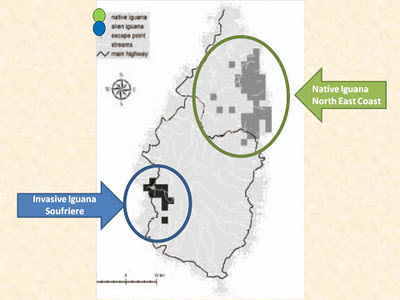 Threats to our Native Iguana by the Invasive Alien Iguana? v Loss of our unique iguana if it happens to cross- breed with the alien iguana. 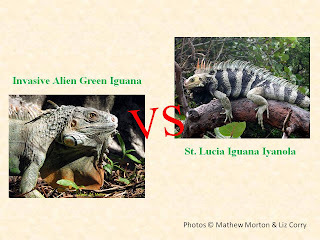 v Extinction of our native iguana through competition for habitat and food. 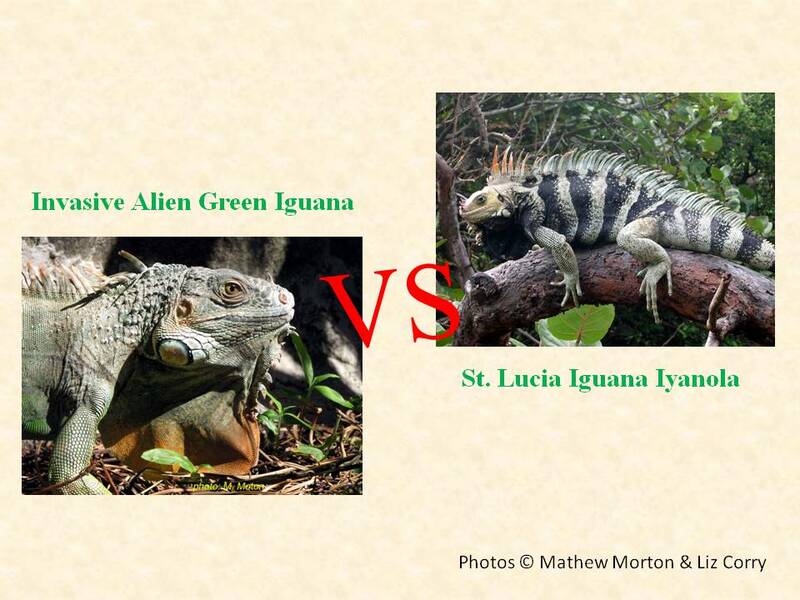 v Future generations may be robbed of the history of our island never knowing our native iguana. Let’s all play our part and educate one another to help in the eradication of this Alien Invasive Iguana before it’s too late! Pigs Gone Wild; A Real Nuisance!! Union Trail Interpretive Centre is reopen!